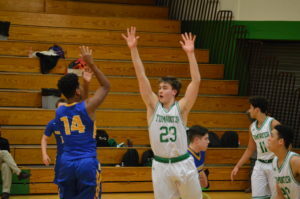 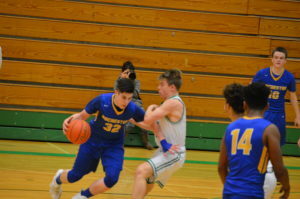 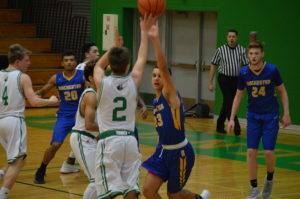 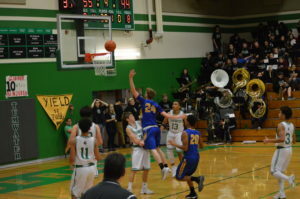 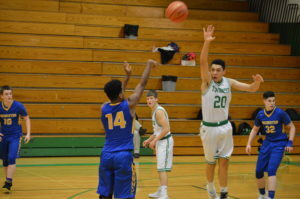 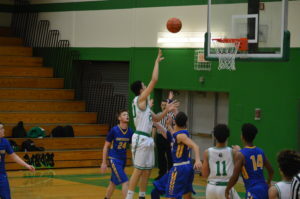 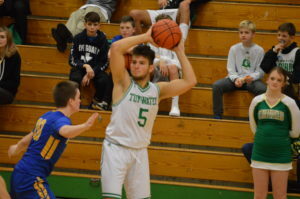 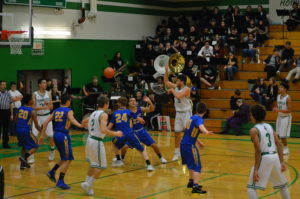 (Tumwater, WA) The Warriors were looking for their 1st league win and the T-Birds trying to bounce back from their 1st league loss when these two met at Tumwater on Tuesday night. 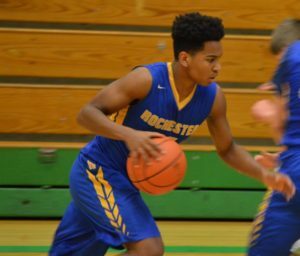 Rochester came out flying high hitting long ball shots to push an early 9-4 lead with 5:32 to play in the quarter. 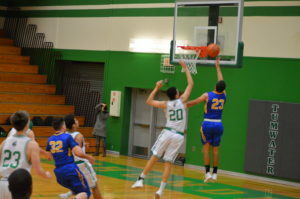 Stephen Robinson hit 2 of those while Keegan Goldrick drained the other. 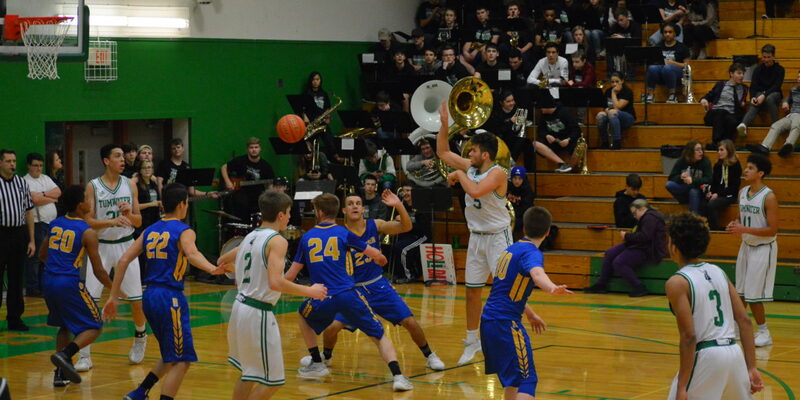 Tumwater’s defense then triggered a 9-0 run and held the Warrior’s scoreless for 5 straight minutes. 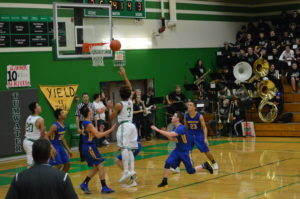 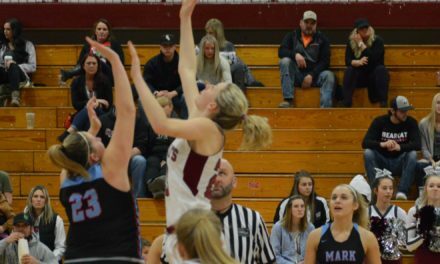 Robinson would hit Rochester’s first 2-point shot with 32-seconds to go cutting it to 13-11 after the first 8 minutes. 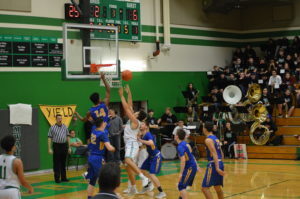 The T-Birds offense then extended their lead in the 2nd quarter outscoring Rochester 17-10 led by CJ Geathers who scored 8 of his first half 12 points in the 2nd period. 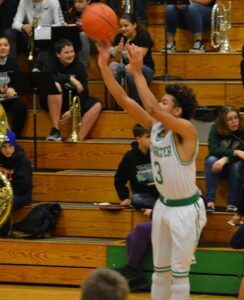 Isaiah Rivera, Jelani Jones, Gunnar Fields and Jack Koelsch all hit from behind the arc in the 1st half with Koelsch’s shot coming as time expired pushing the Tumwater lead to 9 30-21 at the break. 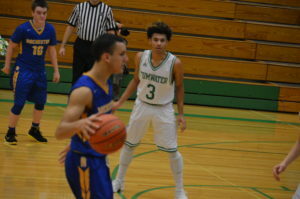 In the 2nd half it was a case of Tumwater keeping Rochester at a safe distance expanding their lead to as many as 13 and as close as the final score of 58-50. 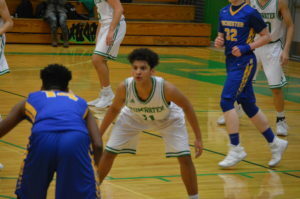 Bryce Lollar had a big 2nd half for the Warriors scoring all 11 of his points in the 2nd half. 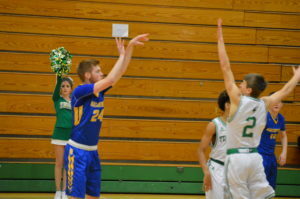 Riley Erickson hit 5 of his 8 in the 2nd half while Tumwater’s defense put the clamps on Robinson’s scoring holding him to 3. Tumwater got a big 2nd half in the scorebook and on the boards from Damon Gaither as he scored all 9 of his after halftime including the 1st 7 points of the 4th quarter. 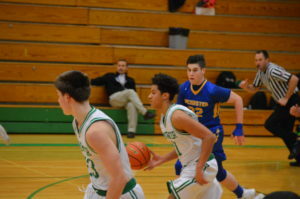 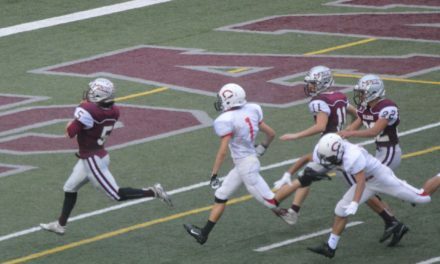 Geathers added to his total finishing with 19 leading all scorers and helped himself at the line finishing 5-6. 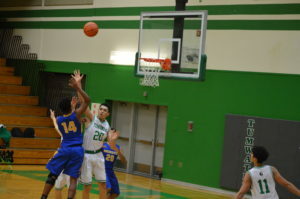 Tumwater is now 2-1 in league and 5-7 overall while Rochester drops to 0-3 and 5-8. 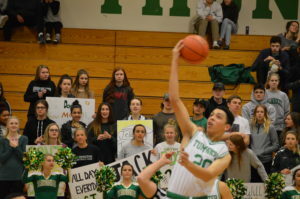 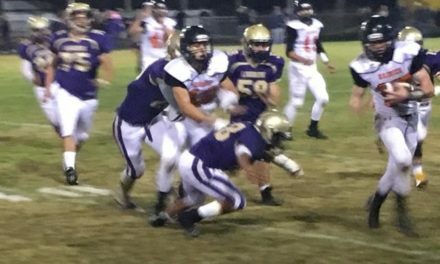 Our Pacific Sports Spa Players of the Game went to the T-Birds’ CJ Geathers and the Warriors’ Stephen Robinson.